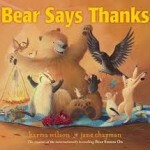 The children in this Thanksgiving book are thankful for playdates, dress-up hats, piggyback rides, puddles and all the things that your preschooler might be thankful for, too. Most of all, they are thankful for their family. 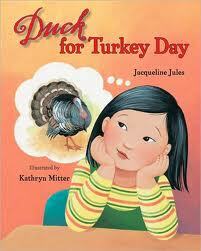 A simple rhyming book that your preschooler will be able to relate to. I also love the illustrations in this book. I love the illustrations in this book, too, so rich and full of detail. 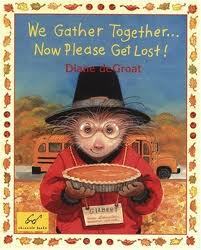 Thanksgiving poems that are cute, clever and probably easy enough to read that your early reader might be able to tackle them on their own. Poems are also great for early readers because the rhyming helps them predict/figure out what unknown words might be and poems aren’t usually long and cumbersome. It takes a lot of energy and concentration to figure out all of those words when children are first beginning to read, so poems are a great way to practice reading and fluency with something short that won’t tucker them out too fast. A sense of accomplishment is something you always want to strive for with early readers and poems are a great way to achieve that goal. Dee donates a can of peas to her school’s food drive and it turns out that her class is going to get to go help serve a Thanksgiving meal at the same place where all of their donated food went. While she is there Dee saves the day by making her “famous” vegetable medley dish and she also makes a friend. This is a great way to show children that donating food is important and that is does actually go somewhere and get used by others. This book would be such a great springboard for some great discussions. If you have a little history buff in your house, then they will love this historical fiction that tells how Abraham Lincoln pardoned the first turkey because his son, Tad, mistakenly had thought it was a pet and had grown so attached to it that he couldn’t bare to see it on their Thanksgiving table. It all ends well and they end up having ham and chicken instead. 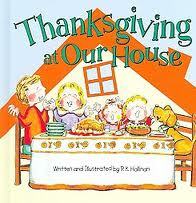 When our youngest was in first grade last year they did an in depth study of the first Thanksgiving feast. He was basically obsessed with the Wampanoag, the pilgrims…the whole deal. So when I saw this book at the library I knew he would love it. It is great because it has a simple rhyming story that goes along with the fantastic illustrations, but it also has in-depth information for those that want to read more. Do you have a tradition in your house that doesn’t follow the norm? Tuyet is very worried that her family is not celebrating Thanksgiving the way you’re “supposed” to and it bothers her so much that she is ready and willing so spend her allowance money to make sure her family has a turkey at Thanksgiving. Once her family’s Thanksgiving duck starts cooking and the house is filled with the familiar smells of wonderful cooking she is familiar with, her need for a turkey fades away. Even better, when she returns to school the next week she realizes that her family isn’t the only family who didn’t eat a turkey…there are many ways to celebrate Thanksgiving. This story follows a family on Thanksgiving day as they get ready for their feast, watch parades on TV, play in the leaves, take food to elderly neighbors and enjoy dinner at home with their family. This Thanksgiving book is a fun reminder about being thankful for our blessings including our wonderful friends, neighbors and family members. 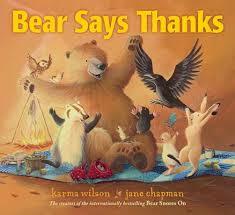 This would be a good book for children to use to start thinking about what they are thankful for. 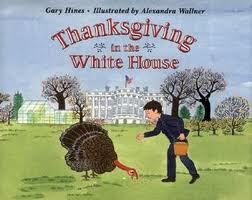 The firefighters are trying to make their Thanksgiving dinner, but they have to keep leaving to go fight fires. At the end of the day after coming and going and coming and going many times, they arrive back at the fire station to find that some very nice people have brought all of the firefighters a Thanksgiving dinner. 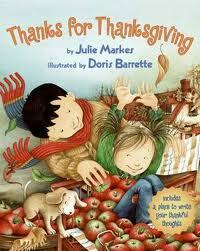 If you have a little one that loves firefighters, then this is the perfect Thanksgiving book for your family. Gilbert’s morning starts off with him waking up late, going to school with toothpaste all over his shirt, missing breakfast and getting to school late so that there is only one person left to be his partner on their field trip…Philip…Philip the tattle tale. Gilbert tries to lose Philip on their field trip and winds up getting himself locked in the bathroom. Guess who comes to his rescue? That’s right, Philip. It turns out that Gilbert ends up being thankful for Philip on his Thanksgiving-themed field trip and Gilbert also finds out that Philip can be a pretty good friend.